Abstract: Crowdfunding allows founders of for-profit, artistic, and cultural ventures to fund their efforts by drawing on relatively small contributions from a relatively large number of individuals using the internet, without standard financial intermediaries. 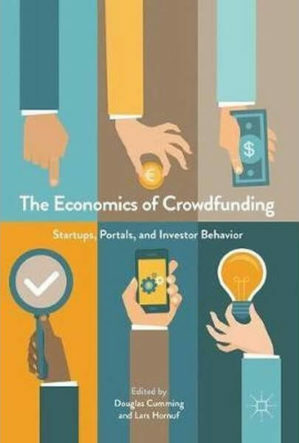 Crowdfunding has been drawing substantial attention from policy makers, managers, and entrepreneurs, but relatively little notice from academics, even though it touches on many topics of importance to scholars of entrepreneurship, including the determinants of venture success and the geography of entrepreneurship. With the recent legalization of equity crowdfunding in the U.S., the importance of this phenomenon is only likely to grow. Already, crowdfunded technology entrepreneurs have proven to be extremely innovative. According to industry experts, many of the most important projects in consumer electronics as of 2013 are funded by crowdfunding, including novel 3-D printers, electronic watches, video game consoles, and computer hardware. Further, some of the most successful crowdfunded projects were turned down by venture capitalists, before successfully raising funding from sites such as Kickstarter. This research will conduct a survey of successful and failed crowdfunded ventures to better understand the ways in which these early stage companies develop, and to shed light on the entrepreneurial process itself by comparing these new firms to traditional venture-backed companies. This data will serve to complement the existing data that has been collected from crowdfunding sites.